DEPARTMENT HEAD is a databasing and communications app for film, television, and commercial professionals. DEPARTMENT HEAD pairs 21st century database computing with the incredible versatility, storage capacity and interconnectivity of the iPAD. PROP MASTERS, STUNT COORDINATORS, HAIR and MAKEUP ARTISTS, VFX SUPERVISORS, DIRECTORS, PRODUCERS, KEY GRIPS, GAFFERS, SCENIC ARTISTS, SET DRESSERS, ART DIRECTORS, ANIMAL WRANGLERS, BEST BOYS GAFFER and GRIP, RIGGING GAFFERS and GRIPS, CASTING DIRECTORS, EXTRAS CASTING DIRECTORS, etc.…. If your work starts with a script — if you attend production meetings or go on location scouts — if you have to track on-set continuity — if you take and store photos of sets or props — if you make shot lists — if you make and track orders, rental, purchases, or repairs — if you run a crew — even if you just track the hours of a crew — then DEPARTMENT HEAD is for you. Create and distribute breakdowns and budgets; set To-Do’s, store your notes, photos, reference videos, links or other attachments all in one place — all from one App — DEPARTMENT HEAD. DEPARTMENT HEAD puts it all at your fingertips. Store your breakdowns, contacts, reference photos, schedules, old scripts — all your work for a film or even for an entire season of a TV show, all on one iPAD. 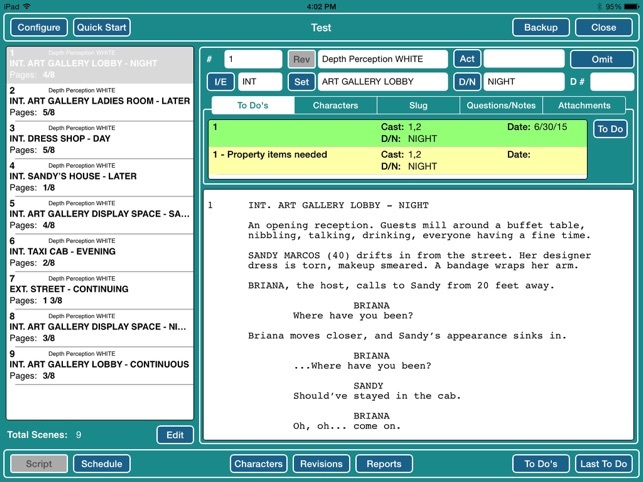 DEPARTMENT HEAD allow users to create a database by either importing a properly formatted Final Draft and Screenwriter script or by manually adding scene fields. 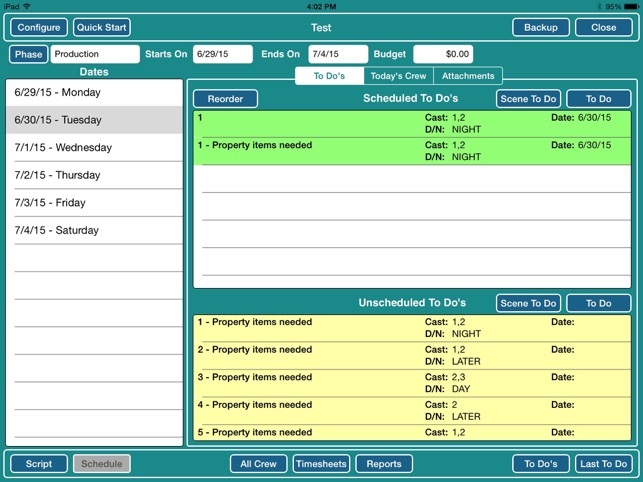 Once Department Head creates the database, users can begin breaking down the script creating budgets and schedules and so much more. If your work depends on the information contained in a feature film or television script, then DEPARTMENT HEAD is for you. 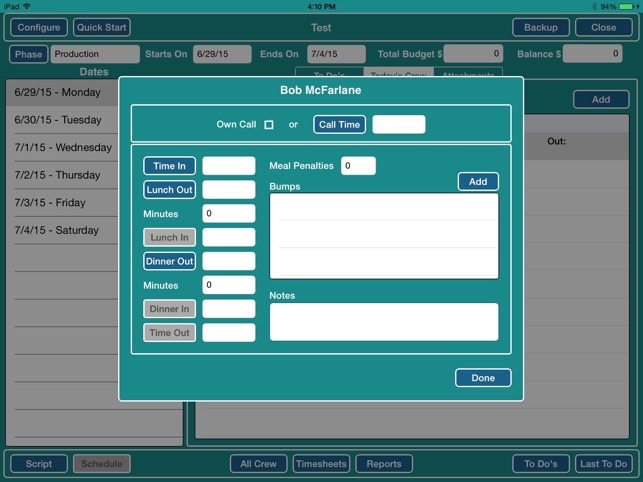 Much like ScriptE Systems other softwares and Apps (ScriptE Digital Script Supervision Software and DH Costume - Costuming Software) DEPARTMENT HEAD is built from the ground up it is not a Filemaker add-on and requires no other software to operate. Built by the creators of ScriptE Digital Script Supervision software and tested by top industry professionals, Department Head is a quantum leap forward in script based databasing and communications for Film,Television and Commercials professionals. When selecting scenes to add them as to do's on the schedule, an "Add" button was mistakenly showing on the pick list. Fixed a problem when adding scene based to do's to the schedule when not linking to the Calendar app. Fixed a potential problem with the app crashing when adding scene to do's to the schedule when linked to the Calendar app. Improvements and fixes for Final Draft script imports in part due to changes by FD.